The Franklin County Soil and Water Conservation District is one of the primary source of planning information for stormwater information in Franklin County. 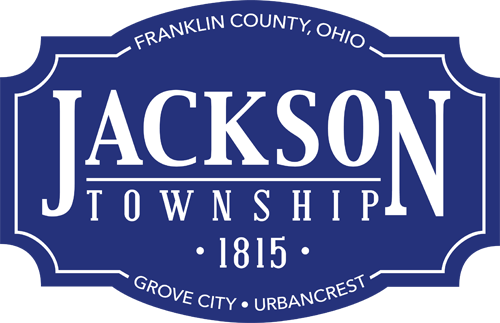 Jackson Township is a partner with the other county agencies and townships in Franklin County for our NPDES Permit. Report illegal dumping or storm water pollution problems directly to the following agencies. A rain garden is an attractive landscaped area in a low spot. They catch storm water runoff from rooftops, driveways, sidewalks, roads, and other impervious surfaces that would otherwise carry polluted water directly to our creeks and streams. Rain gardens are planted with deep rooted, water and drought tolerant plants. They can be installed on residential lots (urban and rural), commercial lots, and community areas. 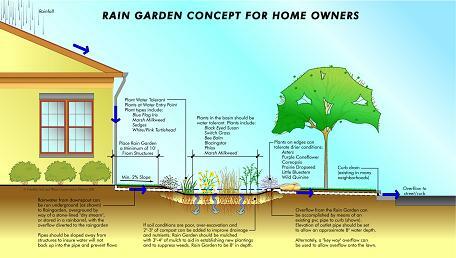 Rain gardens allow rainwater and snow melt to seep naturally into the ground. They function to slow and reduce storm water runoff. The deep roots allow for infiltration of water, providing better percolation compared to short-rooted turf grass. Pollutants carried from runoff are collected in the rain garden and filter through the root system and the soil. Groundwater carried away from rain gardens allows for cleaner water to enter our streams. Another popular residential stormwater solution is to install a rain barrel at the downspout to collect rainwater from the roof. Once full, the rain barrel’s diverter will then channel water back into the downspout. Rain Barrel workshops are held in Grove City throughout the year; you can contact the Grove City Service Department at (614) 277-1100 for more information on registering for these workshops.